Weather Topic: What is Fog? Fog is technically a type of stratus cloud, which lies along the ground and obscures visibility. It is usually created when humidity in the air condenses into tiny water droplets. 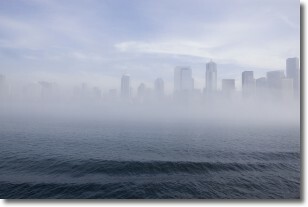 Because of this, some places are more prone to foggy weather, such as regions close to a body of water. Fog is similar to mist; both are the appearance of water droplets suspended in the air, but fog is the term applied to the condition when visibility is less than 1 km. 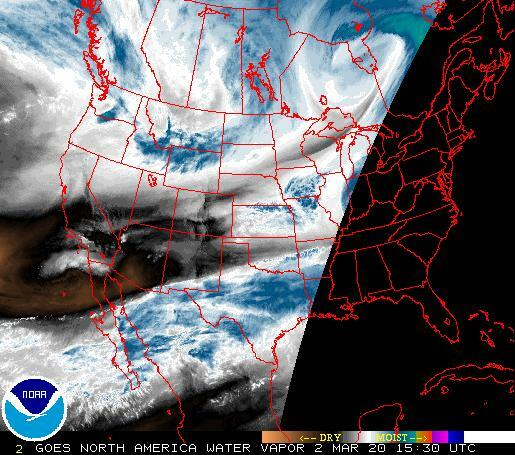 Weather Topic: What are Hole Punch Clouds? A hole punch cloud is an unusual occurrence when a disk-shaped hole appears in a cirrostratus, cirrocumulus, or altocumulus cloud. When part of the cloud forms ice crystals, water droplets in the surrounding area of the cloud evaporate. The effect of this process produces a large elliptical gap in the cloud. The hole punch cloud formation is rare, but it is not specific to any geographic area. 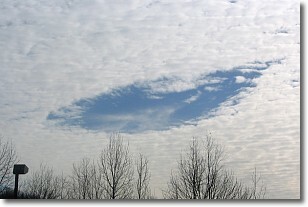 Other names which have been used to describe this phenomena include fallstreak hole, skypunch, and cloud hole.